Greg Davidson began appearing professionally when he was just thirteen years of age. By sixteen, Davidson had embarked on a journey that would soon rocket him to the stages of hotels, theaters and luxury cruise ships worldwide. By twenty he had established himself as a truly international, master in the art of theatrical stage illusion. In his thirties, Davidson became a sought after entertainer and speaker for top corporations. Little did he know, his most important work was yet to reveal itself. In the midst of the bright lights of Las Vegas, Davidson felt a tug on his heart. As he struggled to understand, it soon became clear; God had other plans. God was calling Davidson to service, to a life of change and a commission with an eternal promise. Today Greg Davidson shares his God-given talents along with the energy and candor of his faith, in each "Believe It!" ...Celebration of Wonder. Through the focus of this unique ministry, God has blessed the lives of literally thousands of people who have made personal commitments to accept Jesus as their personal savior. You’ll be thrilled by his professional entertainment, inspired to hear the story of his exciting faith in Jesus Christ, and most importantly of all, to learn how this can become a reality for you! • Pack your church and touch the lives of your community who would not otherwise attend. This is the best way to fill your church with visitors and introduce your friends to God’s love in a non-intimidating environment of humor, magical entertainment and message. 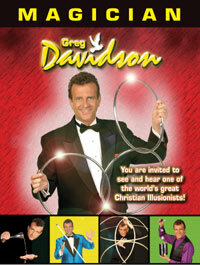 • Invite your church and your entire community to attend all four of these insightful, revealing and super entertaining presentations by internationally recognized Master Illusionist, Greg Davidson. • Each program is uniquely different, offering mysterious fun, hilarious comedy and inspirational importance. • Davidson’s awe-inspiring interactive Christian illusions and witty warmth guarantee that even an audience of remote-control-flicking, multi-media masters will lean forward, listen, and be changed. • This one-of-a-kind, Christ-honoring production of Magical Illusion, Music, Multimedia & Message is a fantastic call to your group and will even draw those who would not normally attend a Christian invitation event. LEARN MORE about "HE's Calling...Pickup!"